Discussion in 'Price Drops, Must-Have Freebies, and Deals' started by Habakuk, Dec 10, 2014. +++You will be surprised to see how many words can be combined from just 9 letters, compete to find them all! 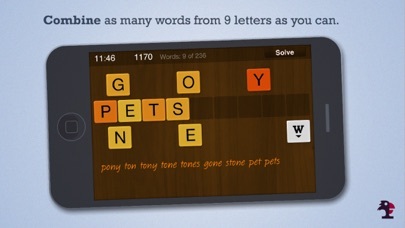 Addictive word game - form as many words from 9 letters as fast as you can. Move the letters to the field in the center. Combine and rearrange to form short and long words. Words must be at least 3 letters long. Find the Solution Word! For each game there is one solution, combined from all nine letters. If you find this word, you are awarded with a special bonus: 10-times the normal word score. You score more for longer words, and also dark colored letters are more difficult to use and score higher than lighter colored letters. If you get stuck - shake it! Shake the game to receive a word suggestion. You can only use this 3 times per game. There is no penalty for using these words, they receive the normal score. 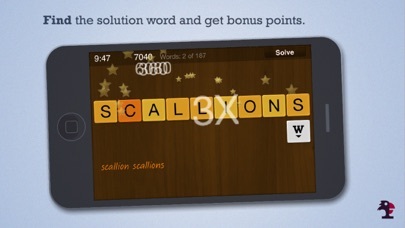 Bonus Scores The solution (word): 10-times the word value word with 9 letters: 5-times the word value word with 8 letters: tripple word value word with 7 letters: double word value. 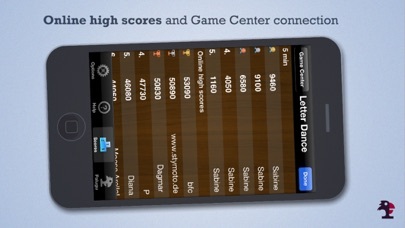 Compete Online Supports the apple Game Center as well as our own Palugu highscore server. See all possible solutions All possible words are shown after each game - you will be amazed to see what words you missed! Critics and Reviews: ***** "Letter Dance - The perfect game for all puzzle fans", by App-Flash "Letter Dance - Brain training", by cepedia.info: ***** "Addictive" by tuckel2001 "This game is addictive ..." Fun!!!! 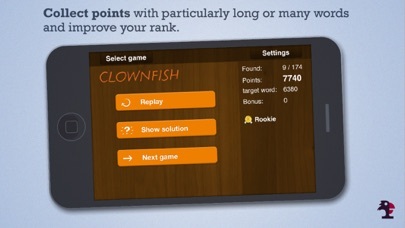 - ***** by Rob1998 - Version 1.3 - Dec 27, 2011 "Real fun, sometimes really tricky, and something for the whole family!" Fun and very intuitive. You can place and change the letters freely. Just put them in the field in the middle, as soon as the software detects a valid word you'll get the points. Multi-language (German, English)! Recommended! 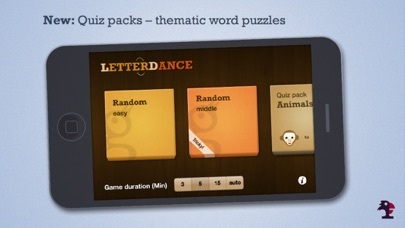 There are IAPs for "Theme packs" but a bunch of levels is delivered already in the standard version. Before the games I was into word gaming apps (still am actually). Just tried it and its a nice quick go-to game but also quite challenging that'll fit well into my breaks at work. Do wish it had a shuffle button of sorts though.